There are three corporate grades of membership, namely Honorary Fellow, Fellow, and Member, and four non-corporate grades of Associate Member, Technician Member, Affiliate, and Student. The Institute is well supported by organisations which have become Sponsor Members and by its Key Sponsors. A recent employment survey shows that of our 3000 members, some 900 are employed in industry, commerce and consultancies, 400 in education and research, and nearly 500 in public authorities. Among the more specialist areas in which acousticians are employed are the audio and hi-fi industry, auditorium and concert hall design, broadcasting, telecommunications, quiet vehicle and product design, sonar system design, human-computer interaction, environmental noise control and health and safety management. 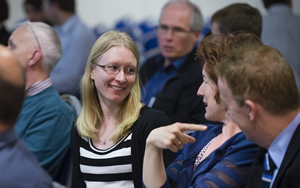 As one of the smaller professional institutions, the Institute of Acoustics has particular strengths in its learned society programmes and its cohesive role for the subject. There is a club atmosphere in its activities and it is possible for members to maintain personal contacts with colleagues engaged in other related areas of acoustics. There is a high participation rate by members in the conference, subject specialist meetings and regional branch activities of the Institute. The Institute offers members a Continuous Professional Development support scheme, a feature which is becoming increasingly recognised as an essential element in ensuring that professionals can keep up-to-date with rapidly changing technological and regulatory issues. Specialist interests are catered for through specialist groups, and regional activities are promoted by a number of regional branches. The work of the Institute relies heavily, of course, on the voluntary efforts of many members of Council, of its Standing Committees and of the Group and Branch Committees. The Institute publishes a bi-monthly Acoustics Bulletin, containing articles of professional, academic and technical interest and the Institute's Proceedings record the two hundred or more papers presented at our formal meetings each year. An education programme, comprising a Diploma in Acoustics and Noise Control and several Certificate of Competence courses is offered at a number of Centres throughout the UK. The Diploma is also available by tutored distance learning.